It holds the planets in their orbits, it provides life-giving energy, and it dominates our sky. The Sun truly is the center of our local universe. The Sun is located at the center of the Solar System. All the planets, minor planets (asteroids), Kuiper Belt objects, and most comets are gravitationally bound to it in orbits. To the ancient Greeks it was Helios; the Romans Sol; to the Egyptians it was associated with one of their leading gods, RA. The Sun contains 99.8% of all the mass in the solar system, with the eight planets, the dwarf planets, asteroids, comets, and meteoroids make up the remaining two-tenths of a percent. It dominates everything in its region of space. The Sun is a massive 865 million miles (1,392 million km) in diameter; by comparison, Earth measures only 7,920 miles (12,746 km) wide. In fact, the Sun is so massive that you could fit Earth 1.3 million times inside, and it has about 330,000 times more mass than Earth! Because the Sun is not a solid body, like a rocky planet is, but rather is a huge globe of intensely hot gas, it does not rotate as a solid mass. It rotates faster at the equator - around 25 days for a full rotation - than it does at its polar regions where it takes a much longer 35 days. The Sun, along with its retinue of planets and other bodies, orbits the center of the galaxy, taking around 220 - 260 million years to complete one circuit at a speed through space of around 135 miles per second. It, and everything else in the solar system, is made from the material ejected during the explosive destruction of earlier generations of stars. In fact, scientists think our star probably belongs to the third generation of stars born after the Big Bang. Although it looks big and bright in our daytime skies, the Sun is, in fact, a fairly ordinary star as stars go. Its surface temperature is a white 9,932 °F (5,500 °C), though to our eyes it looks yellow, as part of its blue light is scattered in the atmosphere of Earth. The Sun is composed mainly of hydrogen (74% by mass) and helium (25%), with small amounts of some other elements. Its internal structure is broken into 3 zones: the core, the radiation zone, and the convection zone. In the core, the pressure is so great that hydrogen atoms get squashed together (fused) to form helium, releasing prodigious amounts of energy in the process. The temperature in the core is a staggering 56.3 million °F (13.5 million °C) and every second 4.4 million tons of matter is converted into energy. The radiation zone extends about two-thirds of the way out from the core. The energy released in the core's fusion reactions fights its way through the thick radiation zone, being continually absorbed and re-emitted. Once the energy has reached the edge of the radiation zone, it heats the gases at the bottom of the convection zone. 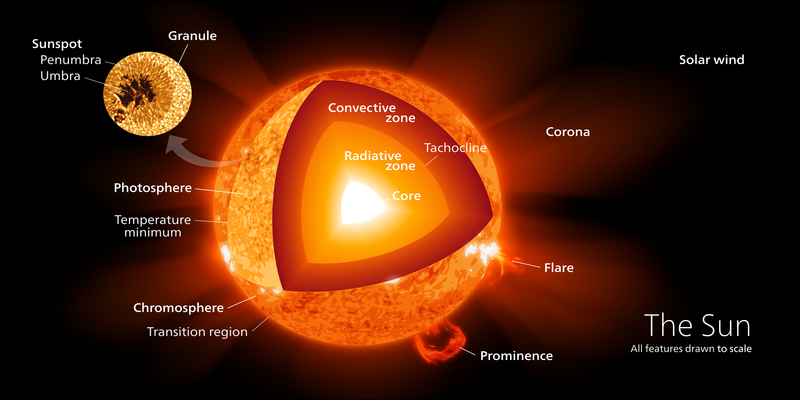 These gases form into huge currents that flow up to the Sun's surface - where the energy is finally released into space as electromagnetic radiation, e. g. light, infrared, ultraviolet - and then the currents sink back down again to pick up more energy from the top of the radiation zone, and start the whole process over again. The journey of energy from fusion in the core to emission at the surface can take anywhere up to millions of years. The visible surface of the Sun is called the photosphere. Close inspection using professional telescopes show the surface to have a speckled appearance which is known as granulation. These "granules" are actually the tops of the convection currents. Extending out from the photosphere is the sun's atmosphere, and it, too, is divided into different regions. The first region is called the chromosphere. It is about 1,250 miles (2,000 km) deep, and temperatures in the gas here can reach up to 180,000 °F (100,000 °C). Above this is a transition region, where temperatures steadily climb to around 1.8 million °F (1 million °C). Finally, the outer region or Corona is reached, where temperatures peak at up to several million degrees more. The corona extends a long way out from the Sun, and can be seen from Earth during total solar eclipses. Why the temperature increases so markedly from the Sun's surface out to the corona is not fully understood, but it is tied in with the strong solar magnetic field. As well as electromagnetic radiation, particles are also emitted from the Sun's surface. The bulk of this is known as the solar wind, which blows through the solar system way out to beyond Pluto. In fact, the Sun blows a huge bubble in space, known as the heliosphere. Being largely made of plasma, the Sun creates its own magnetic field. Its rotation causes the field to become twisted and distorted. This leads to phenomena like sunspots and prominences. Sunspots are small regions of cooler gas on the Sun's surface. They reach temperatures around 7,000-8,000 °F (4,000- 4,500 °C) - it's only the comparison with the hotter adjacent gas that makes them look dark. Sunspots are tied in with complexities in the Sun's magnetic field and it is thought that the field reduces the amount of convection from the convection zone, which lowers the energy reaching the surface in the local region of the sunspot. It has been known for a long time that sunspot numbers rise and fall in a 11-year cycle that has a definite minimum and maximum. At the time of minimum, very few sun spots are seen, and those that are present are usually found at high solar latitudes (i.e. towards the poles). 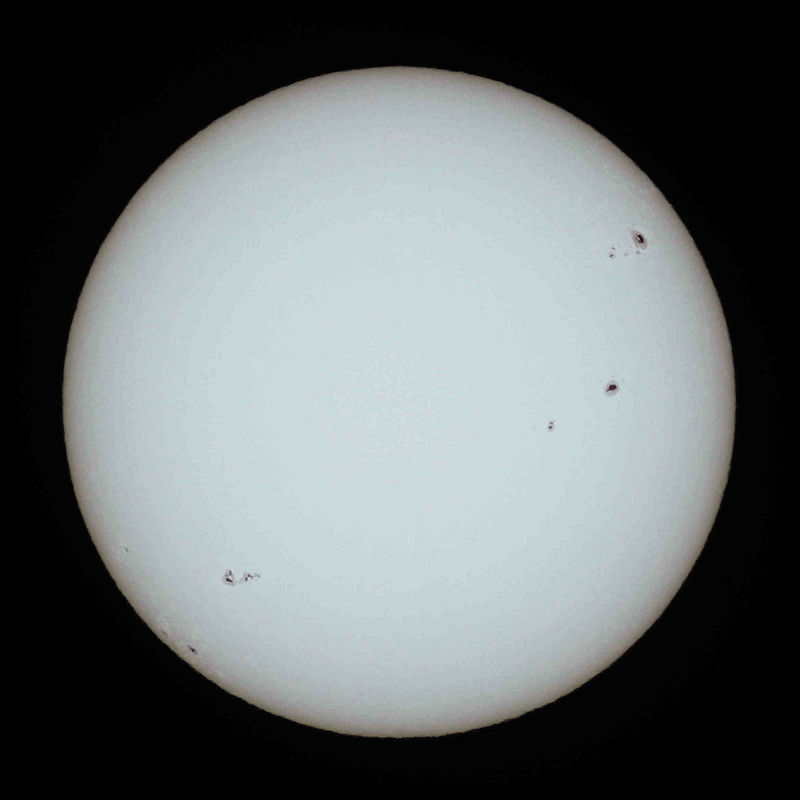 As the sunspot cycle moves towards maximum, the number of spots increases, and they appear closer and closer to the Sun's equator. During the period of each sunspot cycle, the Sun's magnetic field completely reverses, so after 22 years the magnetic field returns to its original orientation. From time to time the Sun lets off violent explosions, such as solar flares and coronal mass ejections (CMEs). Both involve huge amounts of energy and can send streams of particle heading out into the Solar System. Whiles it's extremely unwise for people to look directly at the Sun, as serious eye damage or blindness can occur, there is one time when it is possible to see the corona with the naked eye - during a total solar eclipse. It just so happens that the moon is about 400 times smaller than the Sun, but also 400 times closer. As the moon orbits Earth, it sometimes gets in the way of the Sun and blocks it's light, causing an eclipse. When this occurs, the photosphere is blocked from view and the beautiful, wispy Corona stand out. Enthusiasts travel to remote corners of the world just to witness a few precious seconds of this incredible spectacle. 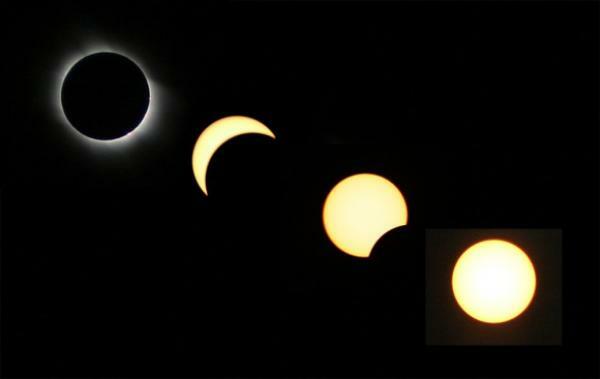 Total solar eclipses are of special interest to astronomers because it is the only time the Sun's corona can be seen from Earth's surface. Observers can detect and measure properties of the Sun's outer atmosphere, such as temperature, density, and chemical composition, when the light of the disc is completely blocked by the moon.